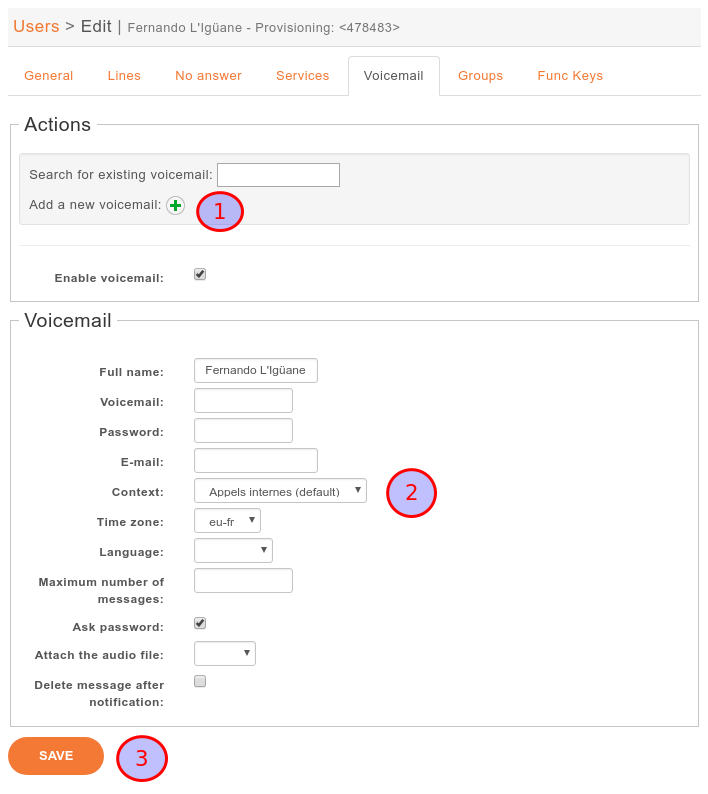 The global voicemail configuration is located under Services ‣ IPBX ‣ General Settings ‣ Voicemails. New voicemails can be added using the + button. 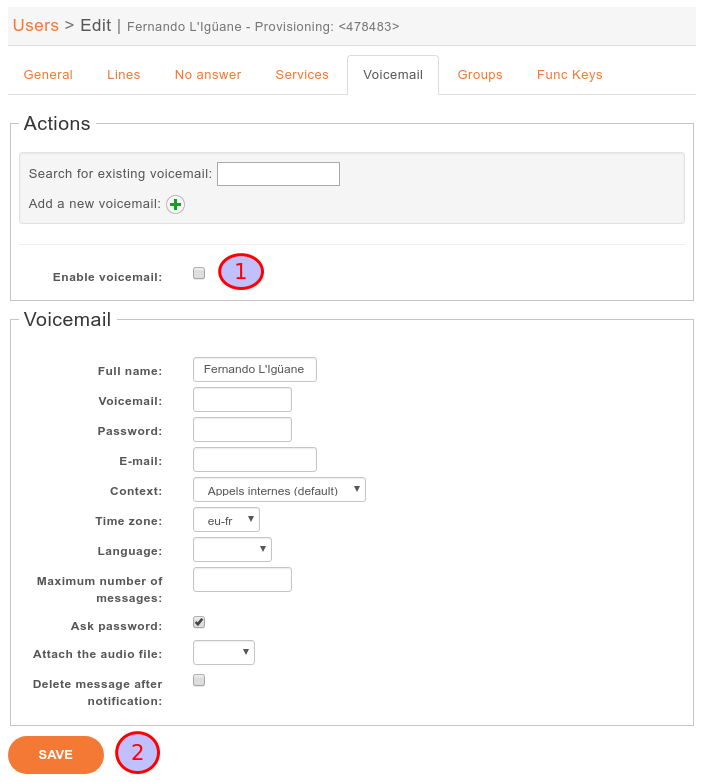 Once your voicemail is configured, you have to edit the user configuration and search the voicemail previously created and then associate it to your user. 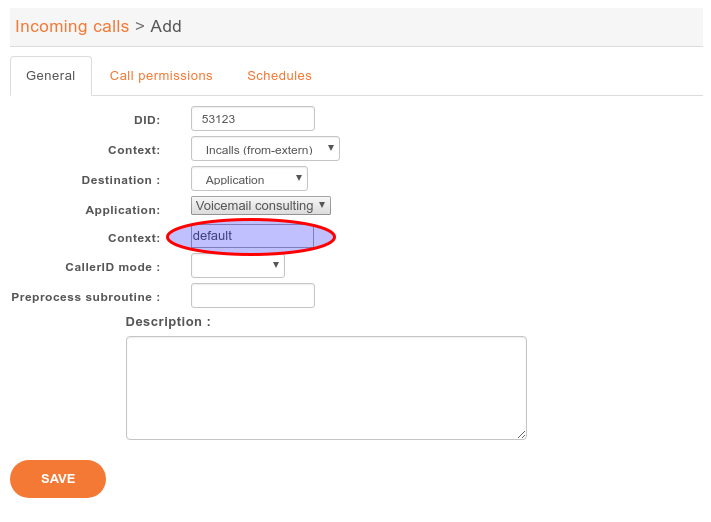 You can disable a user’s voicemail by un-checking the ‘Enable voicemail’ option on the Voicemail tab from user’s configuration. Delete voicemail is done on Services ‣ IBX ‣ IPBX settings ‣ Voicemails or from the user’s voicemail tab. Deleting a voicemail is irreversible. It deletes all messages associated with that voicemail. If the voicemail contains messages, the message waiting indication on the phone will not be deactivated until the next phone reboot. Unchecking the option Ask password allows you to skip password checking for the voicemail only when it is consulted from an internal context. If the the *99 extension is enabled and a user does not have a password on its voicemail, anyone from the same context will be able to listen to its messages, change its password and greeting messages. And then, we will be granted access to the voicemail. Take note that the second “context” field contains the context of the voicemail. Voicemails of other contexts will not be accessible through this incoming call. For security reasons, such an incoming call should be avoided if a voicemail in the given context has no password. Default message can be set in Services ‣ IBX ‣ General Settings ‣ Voicemails and it can be customized from tab E-mail in Services ‣ IBX ‣ IPBX settings ‣ Voicemails. Letters ; and \ must be preceded with backslash and , (comma) can be written only in the default message. 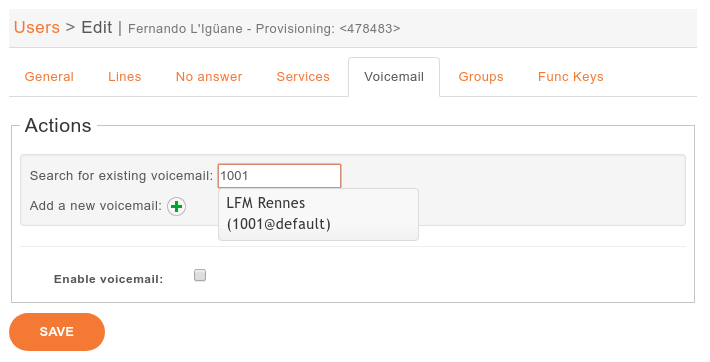 If xivo-confd is on a remote host, xivo-confd-client configuration will be required to be able to change the voicemail passwords using a phone.